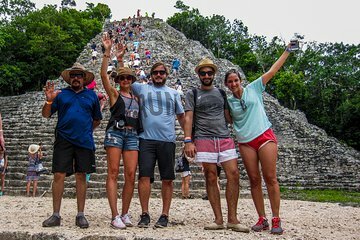 On this guided day trip from Playa del Carmen, visit ancient archaeological sites—in both Tulum and Coba—in just one day. After a light breakfast, sit back and let your driver whisk you to Tulum and Coba. Visit Maya ruins, climb an ancient pyramid, and swim in the waters of the Cho-Ha cenote, an ancient underground cave. Lunch, drinks, bottled water, and round-trip transportation are included. From your hotel lobby or aparment doors. Some hotels and aparments in Playa del Carmen Down Town have a meeting point to pick you up. We`ll provide to you the afternoon before your pick up time and pick up point. Check your email the afternoon before to the tour from 15:00 or call us after 12:00 pm to the cel number we provide please.